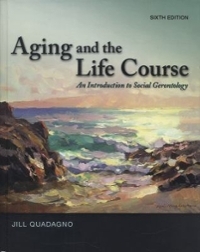 Aging and the Life Course 6 Edition Jill Quadagno’s groundbreaking text Aging and the Life Course examines the relationship between quality of life in old age and its experiential catalysts. Throughout the text an emphasis is placed on the intersectionality of race, class, gender, and culture, and how these classifications affect quality of life. Students will come away with a broad background for understanding crucial and current policy debates.